Florida Literature: A Case Study offers a sampling of literary works, essays, images, and historical documents from the state Carl Hiaasen said is "so colorful, the material so rich, it’s no wonder Florida has a history of great writers." Inside this book, you’ll find works from everywhere in Florida—from the sand, the swamp, and the sea to deep pine forests, vibrant cities, and, of course, Disney World. The stories, poems, essays, images, and historical documents are but a sampling of the rich and diverse writings from and about Florida. Each work is introduced by a biographical headnote and prereading prompt and followed by questions for discussion and writing. We invite you to enjoy this collection and hope it enriches your own perspective on the sunshine state. 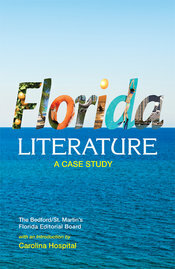 "Not only do the readings in this book lend themselves perfectly to thematic instruction of a deep concept (Florida culture), they also provide great connections to the lives of my students."